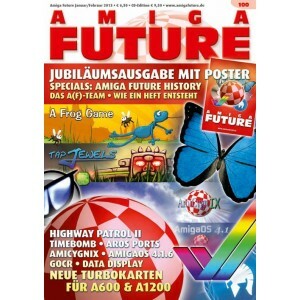 Issue 100 (January 2013) of Amiga Future. Modding : LED, turbo cards ACA , posters, Breezin , Amiga Future editors , History of the Amiga Future , The Making of Amiga Future . Interview Tomasz Muszyski , Interview Gerhard Bauer , Interview Kassian Alexander Goukassian , Fair report Amiga meeting in Bad Bramstedt , editorial , table of contents , news, Up2Date , imprint, cover CD contents , letters to the editor , preview . Issue 101 (Marz 2013) of Amiga Future.